You may wonder why anyone would want to preserve a pigeon in this way, spreadeagled and missing some fairly significant parts of the anatomy. In fact, the bits that are missing include most of the parts required for flight, which I find interesting – so I’ll be mainly look at what’s not there. You might think that feathers make the bird, but if there’s one thing we’ve learned in the last 15 years, it’s that feathers are a characteristic of dinosaurs including birds. That means that while feathers are used in flight, we shouldn’t assume that flight is their primary function. The few remaining feathers on this specimen may help smooth the flow of air over the head, but mainly their will be performing a role in trapping air to keep in warmth. Pigeons also have strutting courtship displays, where the colour and condition of the plumage contribute to the male’s ability to get lucky. The most notable feathers missing from this specimen are the ones from the wing and tail that are adapted for flight. These have a stiff rod challed a ‘rachis’ the runs down the length of the feather – but not right down the middle. This support will be closer to the leading edge of the feather so that the profile of each one follows the shape of an aerofoil. These asymmetrical feathers are what we would look for in fossils to see if the animal could fly. No asymmetry = no lift. 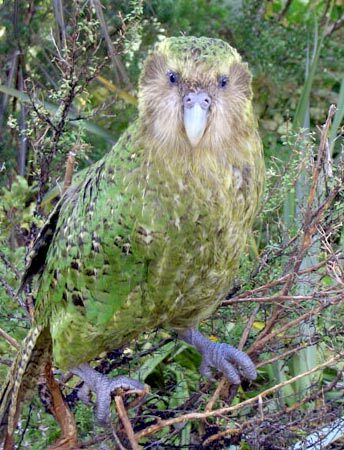 Modern birds that have eschewed flight largely lose this asymmetry, although it may still be faintly there in some flightless birds that climb and ‘parachute’ from trees, like the kakapo. Like the flight feathers, the whole bird wing forms an aerofoil shape, with the bone and fleshy bit of the bird ‘arm’ along the leading edge and the firmly attached feathers forming a thin trailing edge. The most important part of the wing for flight is the ‘hand’ area – yep, that’s the bit that’s been cut off this specimen. The bird hand is weird, it’s fused and reduced to form a strong and stiff bony point that the primary flight feathers attach to. It’s these feathers that do the heavy work of flight, dealing with significant forces as they deform the air in order to keep the bird in the air. Of course, the power for the flapping forces that the feathers convey to the air has to come from somewhere, which is where the powerful pigeon pectorals come in. These chest muscles are what power the downstroke of the wing, creating a huge amount of force. In a live pigeon these muscles are attached to a large and robust sternal bone which has a central keel or ‘carina’. This bony plate gives the muscle something to work against, but is again it is missing from this specimen. Finally, I can’t forget to mention the missing feet. You may not think of the lower legs of a pigeon as being important in flight, but they do perform an important function in getting the bird off the ground. Pigeons are excellent fliers and can take off vertically, which is a surprisingly difficult feat for a bird of that size. Part of their secret is a jump, which gets them accelerating upwards and gives them clearance to make a complete and fully extended downstroke and upstroke (which creates a ‘clap’). Of course, the feet are very useful for landing as well – I for one wouldn’t fancy getting on a plane with no landing gear. 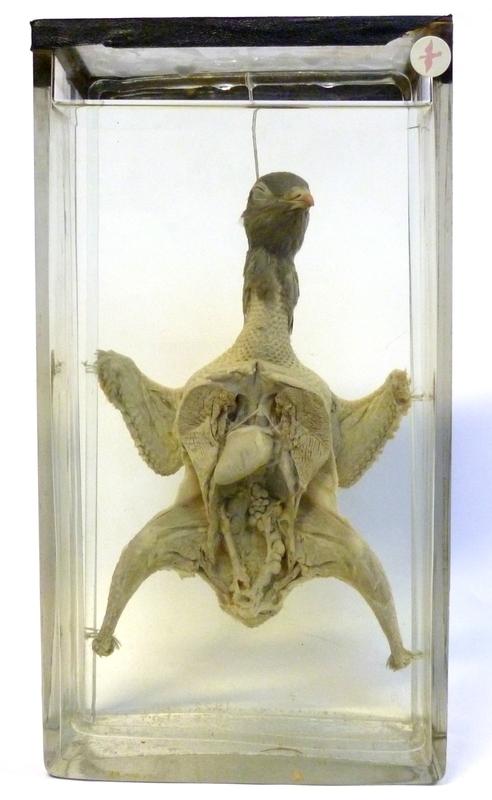 I’m pleased to say that I’m not the only person to appreciate this deceased, dissected and defeathered dove, since artist Suzanne Stryk has done a lovely illustration of it, along with some other Grant Museum specimens – it’s well worth checking them out.